The Weekend Edition’s Pop-Up Hotel allows guests to win a night in unique places and spaces in the cities you love – where no others have previously rested their heads! 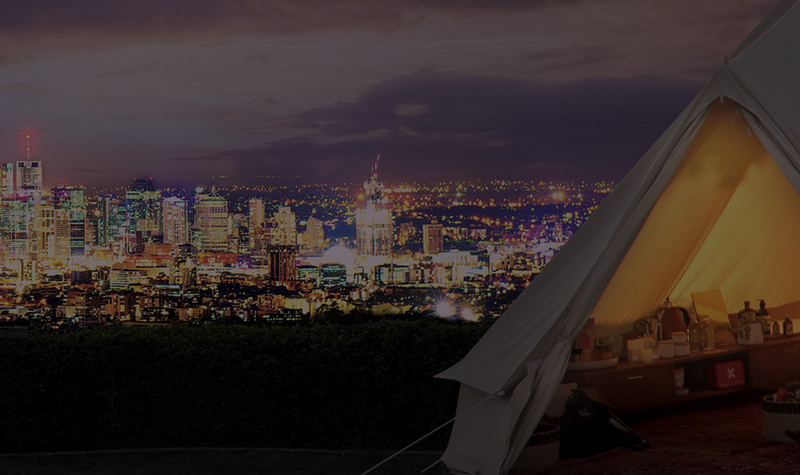 Whether tucked amongst the joyous vibe of the Bleach* Festival on the Gold Coast, the energy of the Brisbane Festival or overlooking the river at Northshore Containerval Festival, The Pop-Up Hotel delivers a one-of-a-kind whimsical accommodation experience. With a nod to the act of luxury camping, The Pop-Up Hotel sees guests stay in the roomy luxurious bell tent, complete with discerning grooming products and locally made nourishment to satisfy midnight cravings. Luxury bed linens from Sheets on the Line cover a cloud-like bed, while a seating area allows for guests to slow down and enjoy the finer things in life within the magical abode. Sip on Brisbane’s finest coffee from specialty coffee roaster Wolff Coffee Roasters and take a moment to relax as the smooth sound of vinyl fills the cosy dwelling. Check out The Weekend Edition’s Captured gallery from The Pop-Up Hotel at the Bleach* Festival for a glimpse at all the details. The Weekend Edition has partnered with Death Valley Fun Camp from May 26–27 to offer two lucky campers the ultimate weekend away with one-of-a-kind glamping experience The Pop-Up Hotel! Enter below for your chance to win! Competition closes at midnight on Thursday May 10, 2018.